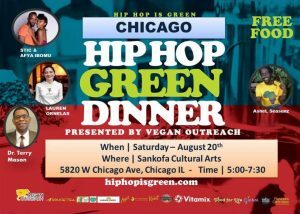 The two-day Chicago Ready to Live Weekend will feature the Hip Hop is Green Dinner at 5 p.m. Aug. 20 at the Sankota Cultural Arts Center, 5820 W. Chicago Ave., Chicago; and the Taste of Vegan Health and Wellness Festival from 10 a.m. to 6 p.m. Aug. 21 at Regenerative Truth, 9352 S. Halsted St., Chicago. Zarakyah Ahmadiel says more is needed to halt the violence on Chicago streets, but it is not more police, more education or more laws. He says it is more green food. He said better eating could not just lower violence in the city and country, but lower incidents of diabetes, heart disease and obesity, too. By getting people to eat more plant-based food, Ahmadiel said, not only are they healthier, but they can better control their behavior, stemming violence. 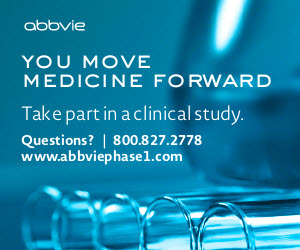 “It’s not just me saying it, science says it,” Ahmadiel said. “We forget that the brain is part of the body, that it is 30 percent water and the rest fats. We are giving our brains the wrong fats. Ahmadiel, who coordinates the providing of free healthy snacks to youths at various Chicago public schools, will be one of the featured speakers at the Chicago Ready to Live Weekend set for Aug. 20-21. The two-day event will feature the Hip Hop is Green Dinner at 5 p.m. Aug. 20 at the Sankota Cultural Arts Center, 5820 W. Chicago Ave., Chicago; and the Taste of Vegan Health and Wellness Festival from 10 a.m. to 6 p.m. Aug. 21 at Regenerative Truth, 9352 S. Halsted St., Chicago. Keith Tucker never expected he would be championing people eating healthier when he went to Seattle’s Vegfest in 2008 as a radio show host. Tucker said he is willing to do whatever he can to get people to eat healthier. For him, it is not an all-out battle to get them to eliminate meat from their diet. He said by getting the hip hop community involved the hope is to inspire youths and families to adopt healthier eating habits. Tucker said getting kids and adults to try vegan and plant-based products can be an uphill battle. They say that those foods don’t taste good, Tucker contends. He said by getting youths and adults to try the food at a free dinner, they learn of their misconceptions. Qia Carswell, the Chicago coordinator for the Ready to Live Weekend, said creating a need for healthy food in the urban community will lead to stores moving to fill that need. “Instead of kids going to the corner store and getting something with no nutritional value, we go and talk through with them what they are eating and why it is important to eat healthy,” said Carswell, who owns Chicago Style Vegan, a vegan food delivery service based in Oak Park. Carswell said the upcoming two-day event is aimed at breaking stereotypes people have. Carswell said by bringing in top chefs, the two-day event showcases how good vegan food is. She said the Hip Hop is Green dinner and the Taste of Vegan Health and Wellness Festival will get residents pointed in the right direction nutritionally. “The two events together are a catalyst of what is to come,” Carswell said. To obtain seats to the free, family-friendly Hip Hop is Green Dinner, go to www.brownpapertickets.com/event/2580688.